20.07.2015: The Alte Wirt Etterschlag has new owners and the text on this page still refers to the old beer garden. The beer garden is open during nice weather Monday to Friday from 5pm, Saturday from 2pm and on Sunday from noon. Alter Wirt Etterschlag is located approximately 25 kilometres south west of Munich. The beer garden with about 500 seats is well shaded below a thick cluster of chestnut trees. There are fixed wooden benches in the self-service area and regular tables and chairs in the serviced area. 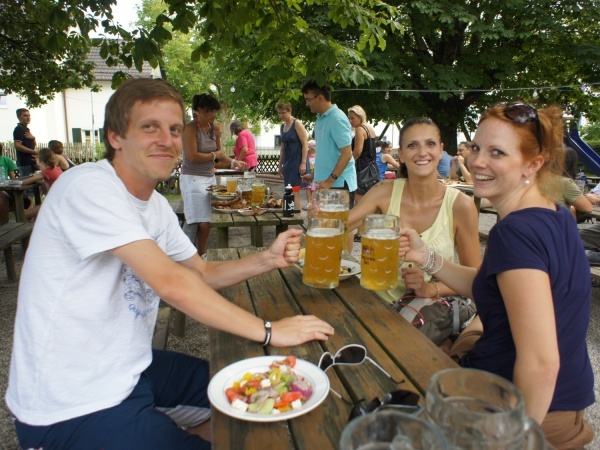 As in all real Bavarian beer gardens it is permitted to bring your own food. That said, traditional German food served here, especially the meat dishes, are highly recommended. The beer served from the tap is from Paulaner and a Maß Hell (lager) costs €6.60 (April 2017). Major football tournaments are shown live on screens in the beer garden. The beer garden is open throughout the summer when the weather is good Monday to Friday from 5pm, Saturday from 2pm and Sunday and public holidays from noon.